This topic describes using the following StorageTek AMLs with Robot Save. These instructions are designed to be used in conjunction with the Robot Save User Guide. The user guide contains a complete discussion of Robot Save AML setup considerations and panels. Note: If you will be sharing the AML and its volumes with multiple IBM i systems, your AML will be part of a Robot Save data center. If you are defining an AML to Robot Save for the first time, the AML name and parameters must be exactly the same on all systems in the data center. If you are setting up an AML on a system that is already part of a data center, the AML definition already exists. See the Robot Save User Guide for a discussion on how to select AML drives and connect the system to the AML. 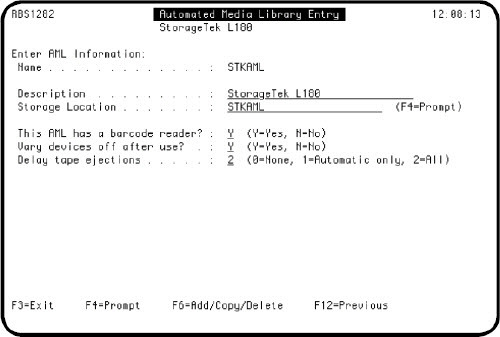 The following panel shows one of the default StorageTek AML definitions shipped with Robot Save. Separate definitions are shipped for each of the AMLs listed above. Copy the appropriate definition for your AML and modify it for your site, as described on the following page. Name Enter a name for the AML that is meaningful to you. If the AML is being shared by multiple systems in a data center, you must use the same name for the AML on each system. Note: The AML name you enter here does not have to match the StorageTek *RML device description name. Description Enter a brief description of this AML or leave the description retrieved from the shipped definition. Storage Location Enter a storage location to use for the volumes located in the AML. We recommend you use the name of the AML as the storage location. This AML has a barcode reader? Enter Y if the AML has a barcode reader; enter N if there is no barcode reader. Vary devices off after use? Accept the default value of Y; all StorageTek AMLs should be varied off after use. Specify if you want to queue volumes for ejection from the AML. Volumes are ejected from the AML when Robot Save moves them to a location other than the AML location. 0 No queueing occurs. No volumes are added to the ejection queue until you turn on queueing. 1 Queues volumes that are attached to automatic move sets and are moved to the ejection queue only during auto move processing following a backup or through the RBSAUTOMOV command. The volumes are ejected from the queue at a later time using the RBSEJQVOL command. 2 Queues all volumes that have been moved by Robot Save to a location outside of the AML. Note: Delay tape ejections does not queue volumes moved outside of Robot Save. See the Robot Save User Guide for complete information on selecting AML drives, connecting the system to the AML, and defining ports for the StorageTek AML. Use the manual volume naming method to name your save media. On the System Setup Media Defaults panel, specify Y in the Use Scratch Media Pool field. All volumes that will be used by the AML must be in the Robot Save scratch pool. Use the RBSAMLLRN command to insert volumes into the AML. The command inventories all the volumes in the AML, adds the volumes to the scratch pool (if they do not exist in Robot Save), and defines the AML location for the volumes. Note: For more information on this command, see "RBSAMLLRN Command for StorageTek Librarians." Robot Save uses the logical ID (internal label) of the volume to update its database. The StorageTek AML locates volumes using the barcode label (external label). If a volume's internal and external labels do not match, Robot Save might not be able to retrieve the volume for backup or restore functions. You should make sure that all volumes have the correct labels. If you need assistance initializing volumes, contact Technical Support. If a volume that is write protected or contains unexpired data is mounted during a backup, Robot Save automatically removes the volume from the AML drive and loads another volume. The volume is flagged with an error condition and cannot be selected again until the errors have been corrected. To resolve a volume error, select option 5, Data Center Error Resolution, from the Operations Menu. See the Robot Save User Guide for complete information on resolving volume errors. If you have multiple systems sharing an AML, we recommend that you select one system to be the Data Center Management System (DCMS). The DCMS should be the fastest system in the data center and the system with the least amount of planned or actual downtime. Once volumes are placed in the AML, they are available to all systems using the AML. If you do not want to share volumes among all systems, you can assign volumes to a specific system. Volumes assigned to a specific system remains assigned until you change it manually by selecting the volume ID. You should be aware that if you are sharing volumes, the volumes assigned to the system are used first; then the volumes that have been used the least; then other volumes, in alphabetical order. If a system other than the DCMS is excluded from the data center, all the shared volumes in the shared scratch pool will be unavailable to that system. If all systems are excluded from the data center, the shared scratch volumes will be available only to the DCMS. Volumes assigned to systems will always remain on those systems.